During an emergency, where power and gas may be hard to come by, a thermos can be a great way to cook a wide variety of slow cooking foods. Cooking things like rice and beans can take hours, using a huge amount of fuel that you usually can’t afford to waste during an emergency. 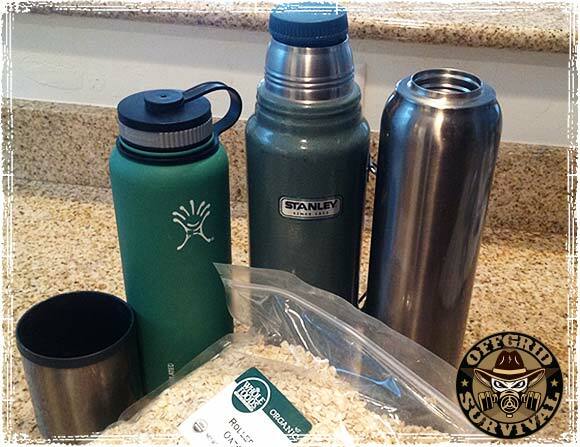 Using a thermos can be a great way to save that precious fuel when cooking things that have a long cooking time. If you’ve ever cooked with a crockpot, then the concept of cooking with a thermos is pretty similar. It allows you to simmer foods for a long time, with only the fuel that’s required to boil the initial water. Cooking with a thermos is pretty easy; in fact, if you can boil water you should be able to pull it off. The key to using this method of cooking is time, so you’re going to want to plan ahead and make sure you have a good quality thermos that will retain its heat while cooking the food. Planning Ahead: Making sure you have enough time to Cook. This method takes time and some pre-planning. Deciding what you’re going to eat an hour before mealtime is not going to work so you need to give yourself enough time to cook the food properly. Remember, this is similar to cooking with a crockpot, so time is a huge factor. When looking for a good quality thermos, look for something that is well insulated, large enough to cook with and something that has a wide mouth so you can easily get food in and out of the container. I’ve been using a Stanley Thermos for years, but some of the newer models have received some poor reviews lately so you might also want to check out brands like Sigg, Nissan, Hydro Flask and Zojirushi. I use the Hydro Flask 32oz bottle because the extra-large opening makes it easier to work with when cooking. Preheating the thermos, before adding your ingredients, will help the bottle maintain heat throughout the cooking process. Before cooking, fill the Thermos with boiling water and let it sit for five minutes. Once you’re ready to add your ingredients to the thermos empty the water and add the new boiling water with your cooking ingredients. What can you cook in a Thermos? When selecting what foods, you can cook in your thermos make sure you pick foods that would normally be cooked in liquid. Most recipes that are designed for crock pots can be scaled down to fit in a Thermos. I would stay away from anything that can be easily overcooked, or foods that cannot be brought to a full boil. Typical Cooking Times: While cooking times will vary depending on your Thermos and its ability to retain heat, here are some general guidelines. The First number is how long you should boil the food before putting it in the thermos; the second number is the amount of time required to cook the food inside the thermos. Some foods will require a bit of precooking, especially things like meat or beans which require high amounts of heat. These foods should be cooked to the point where you would normally turn down the stove to start the simmering process. Once you reach this point, they can then be added to the thermos to finish the slow cooking process. Simple, easily overlooked. Thank you. I will remember this. In such a scenario, room heating fuel will also be at a premium. So your kitchen/house/apartment may be so cold that you are wearing your outdoor gear in it to stay warm. Hence: wrap the thermos in a woollen blanket or some other very good insulator, before laying it on its side on a table, to slow down the heat loss from the thermos to the cold air. Keep it out of draughts too. Smart post. Also can put upright in an insulated box, so that the thermos is surrounded by a thick layer of blankets, towels etc. Can put in the middle of a full dirty clothes hamper ever. Also, if camping, can did a hole deeper than the upright thermos, set the thermos in and cover with soil. I ‘cook’ in a thermos every week day. I heat a cup of milk and add it to the thermos with a 1/4 cup of steel cut oats and a handful of dried fruit. By the time I get to work the oats are perfectly cooked. I just posted an article on freezer bag cooking that works on the same principles. doing this today, for practice. I just popped popcorn, in my thermos. This is amazing. Still riding wave “feelin jazzy” (insert preferred emoji)! Another name for cooking in a thermos, or retained heat cooking is thermal cooking. I have spent the last few years learning about this cooking method extensively. It is possible to make pretty much anything in a thermal cooker. Last year I published a book “Let’s Make Sense of Thermal Cooking Cookbook” to share the tips and techniques I discovered in my research. I would love to know more about how the popcorn was popped in the cooker. I, also, am interested (low-key jazzed),to read TechHermit’s popcorn method si please……tell us!